On the night before his death, Jesus made a promise: those who believed in him would do greater works than he did because he was going to the Father and would ask the Father to send another Helper (John 14:12, 16). The Book of Acts begins the story of how that promise was fulfilled. 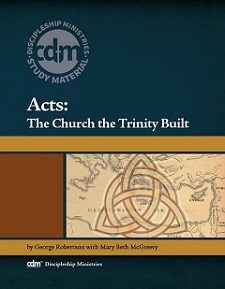 John Stott said this historical account could be renamed, “The Continuing Words and Deeds of Jesus by His Spirit through His Apostles.” In this study, George Robertson explores Luke’s record of the early years of the Church and how the work of Christ through the Holy Spirit continues today. It is a story of how the Father’s plan of redemption is accomplished as the good news of the gospel of his Son is spread through the powerful work of the Spirit. Christ is building his Church; and all the evil designs of Satan will not prevail against it.